With apologies to the Masters, the NBA's annual Christmas Day slate is a tradition unlike any other. For many sports fans, this holiday basketball bonanza also represents the unofficial start of the NBA season. And you can't blame people for waiting until Christmas to tune into the NBA. The annual marquee matchups have produced some absolutely incredible games, from former allies squaring off to the start of an intense rivalry. So to get you ready for Sunday's festivities, here are the seven best NBA Christmas Day games in the past 30 years (give or take a year). Enjoy. The only thing missing from this contest was Michael Jordan, unfortunately, thanks to his retirement the previous summer. Other than that? Shaquille O'Neal and Penny Hardaway were in their first Christmas Day game together, Scottie Pippen showed the world that he could get it done without Jordan (tallying 28 points, eight rebounds and six assists), and to top it all off, Toni Kukoc hit a running game-winner to give the Bulls a thrilling victory. In just the 29th game of his rookie season, Patrick Ewing showed flashes of the Hall of Fame career that was to come. 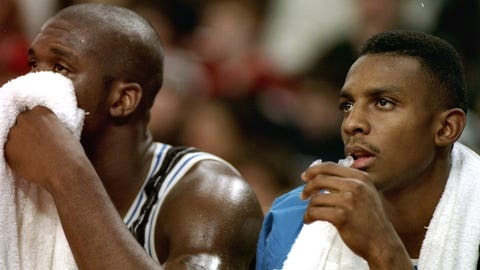 It's not as if Ewing came out of nowhere, of course, given his star-studded college career at Georgetown. 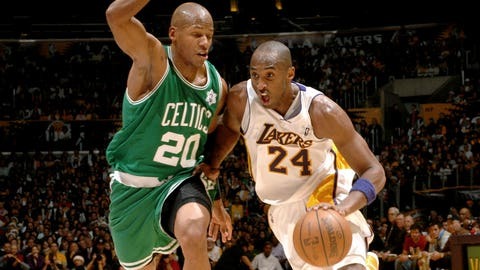 Yet to watch him go toe-to-toe with Robert Parish was an experience unlike anything seen at the previous level. 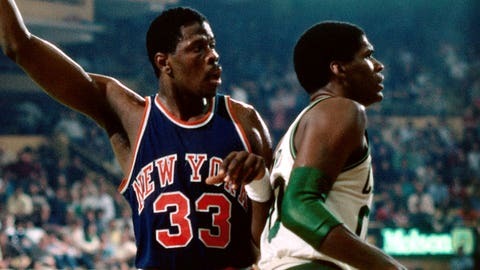 Ewing led all scorers — yes, even topping Larry Bird — with 32 points, helping the Knicks overcome a 25-point deficit to take the win in overtime. 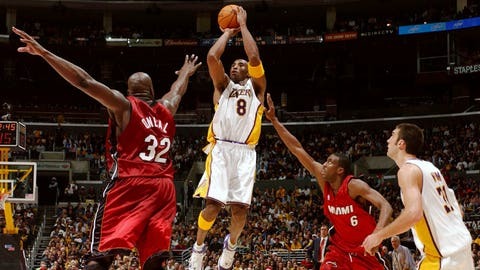 Christmas 2011 doubled as opening day for the NBA due to the lockout that shortened the season to 66 games. With little practice time and way too much rust on both sides, this game was sloppy at times. 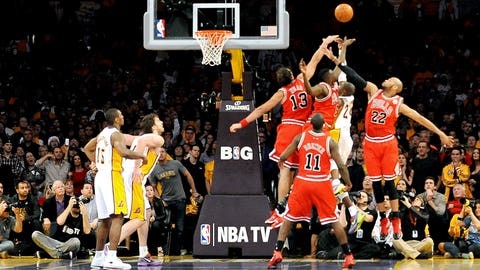 Kobe Bryant, meanwhile, probably still has nightmares about the defense Luol Deng played on him, which allowed the Bulls to claim the victory with a late Derrick Rose dagger. Bryant finished with 28 points on 21 shots, but an errant pass in the closing moments that Deng picked off gave Derrick Rose the chance to bury the Lakers. 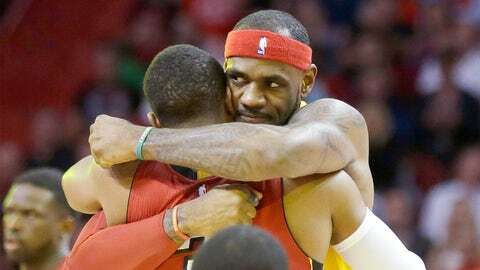 LeBron James' Miami return following his Cleveland homecoming was bittersweet. The fans greeted him warmly, and the franchise honored James (and James Jones, who also went to Cleveland) for his contributions during his time in Miami. Once the game started, however, the Heat defended their home court, even without Chris Bosh, who was sidelined with a calf injury. Miami nearly let a big lead slip away, with the Cavs actually taking a lead early in the fourth quarter, before Dwyane Wade sent his friend and former teammate packing. If you're looking for the beginning of the rivalry between California's two best teams, ths game is as good a place to start as any. Blake Griffin was ejected with two technicals after Draymond Green committed a flagrant 2 foul, and Chris Paul missed a potential game-winner in the final few seconds. 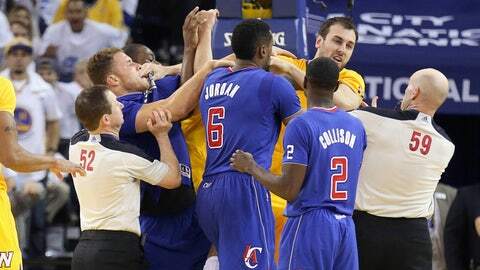 After the final buzzer sounded, the two teams scuffled on their way off the court. "We like them. Merry Christmas," Warriors coach Mark Jackson said after the game. "It's just physical basketball, so we don't get caught up in that." If only we knew then how far the rivalry between the two teams would go. The Celtics entered Christmas Day with a 19-game winning streak — then they ran into Kobe Bryant and Pau Gasol. In their first meeting since Boston defeated the Lakers for the 2008 NBA title, Bryant played spectacularly in all facets of the game and Gasol poured in seven points in the final three minutes to keep the Celtics at bay. The two teams went in opposite directions after the meeting. By March, Kevin Garnett was injured and the Celtics were eliminated shy of a Finals rematchs. 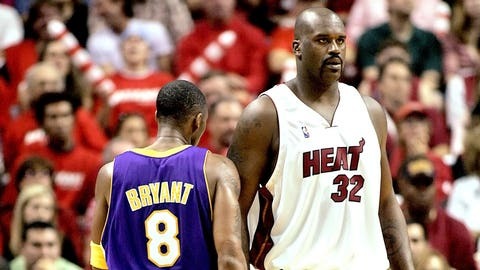 Los Angeles cruised to the NBA title over the Orlando Magic, its first title in the post-Shaquille O'Neal years. It will be borderline impossible to top this Christmas Day game.